There are many species of terrapins for sale. The most popular being the Diamond Back Terrapin for sale. We specialize in both land tortoises for sale as well as turtles for sale, including a large selection of captive bred aquatic turtles for sale. The first two subspecies, starting on the Atlantic Coast at Cape Cod, Massachusetts, and continuing to northern Florida, are the Northern Diamondback Terrapin, and the Carolina Diamond back Terrapin. As you look at the subspecies descriptions found here or in other reference material, and compare them to terrapins found along that range, you may become perplexed. Why? The terrapin in your hand may often seem to be a mix of both descriptions. There’s a reason for that! As one surveys Diamondback Terrapins south along the Atlantic Coast starting at Cape Cod, Massachusetts, there begin to be subtle, then more pronounced differences in the morphology of the terrapins. In any population of diamondbacks, however, there is a great deal of variety in shell and skin color, and in the type of speckling on their skins. The latter variations are par for the course among terrapins, but the subspecies differences are more pronounced. The first two subspecies, starting on the Atlantic Coast at Cape Cod, Massachusetts, and continuing to northern Florida, are the Northern Diamondback Terrapin, and the Carolina Diamondback Terrapin. As you look at the subspecies descriptions found here or in other reference material, and compare them to terrapins found along that range, you may become perplexed. Why? The terrapin in your hand may often seem to be a mix of both descriptions. There’s a reason for that! In the late 1800’s and early 1900’s, Diamondback Terrapins were collected from various points along the Mid-Atlantic Coast as well as Texas and transported to seafood markets in the Northeastern states to supply affluent homes and restaurants when terrapin soup was a high priced gourmet dish. Also during the early 1900’s, terrapins from these same areas were transported to research stations funded by the US Bureau of Fisheries in NC and MD. The purpose of the research was to see if terrapins could effectively be farm-raised for food. Historical accounts and recent genetic studies indicate that uncertain numbers of the transported subspecies escaped or were randomly released into Atlantic coast terrapin populations. 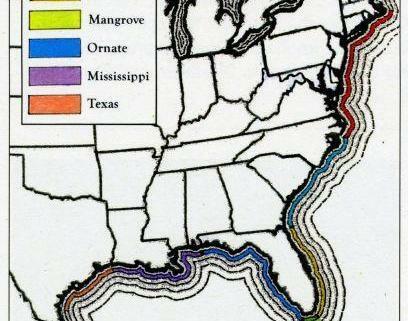 Furthermore, when the Beaufort, NC research station was closed in 1948, nearly 250,000 hybrid terrapins were released into the salt marshes of Virginia, North and South Carolina, and Georgia. It is not uncommon, then, to find individual terrapins in Mid-Atlantic coast populations north of Florida that have characteristics of the Texas subspecies. Northern Diamondback Terrapins are often found with characteristics of The Carolina Terrapin, and vice versa. Furthermore, a small population of Diamondback Terrapins has been studied on the island of Bermuda. This population appears from genetic studies to have been colonized by means of the Gulf Stream by terrapins from the Carolinas at least as far back as the 1600’s. The Florida East Coast Diamondback Terrapin, (Malaclemys terrapin tequesta), ranges from northern Florida southward along the Atlantic coast to the Keys. The medial keel has knobs facing backwards. The scales of the carapace can be a bit lighter in their center surrounded by dark or tan. On the other hand, the carapace of the male tequesta in the first photograph is entirely black. The skin color of the head and legs will be white or gray with small black dots and flecks. The color of the plastron ranges from yellow to orange. The Ornate Diamondback Terrapin, (Malaclemys terrapin macrospilota), ranges from Florida Bay north along Florida’s Gulf Coast and west along the Florida Panhandle. The medial keel often has bulbous knobs. The scales of the dark carapace have orange or yellow centers. Carapaces of some individuals can be entirely black. The skin color of the head and legs is most often white to light gray with black spots. When white a pinkish tinge shows through. The color of the plastron ranges from yellow to orange. The Texas Diamondback Terrapin, (Malaclemys terrapin littoralis), ranges from western Louisiana to Corpus Christi, Texas. The medial keel has terminal knobs. The carapace is dark brown to black, often with concentric grooving. The skin color of the head is white to medium gray with small to medium black spots. Skin coloring on legs ranges from gray with dark spots to entirely black. Texas terrapins can be quite a bit larger than other subspecies. This explains their export to NE markets and to the Beaufort, NC research lab in the early 1900’s.